Thanks again to our fantastic guest bloggers Laura and Vinny for this scrumptious foodie review! As fans of both Indian food and street food, we were excited to be invited to try out the new branch of Dabbawal, which opened in West Jesmond this summer. 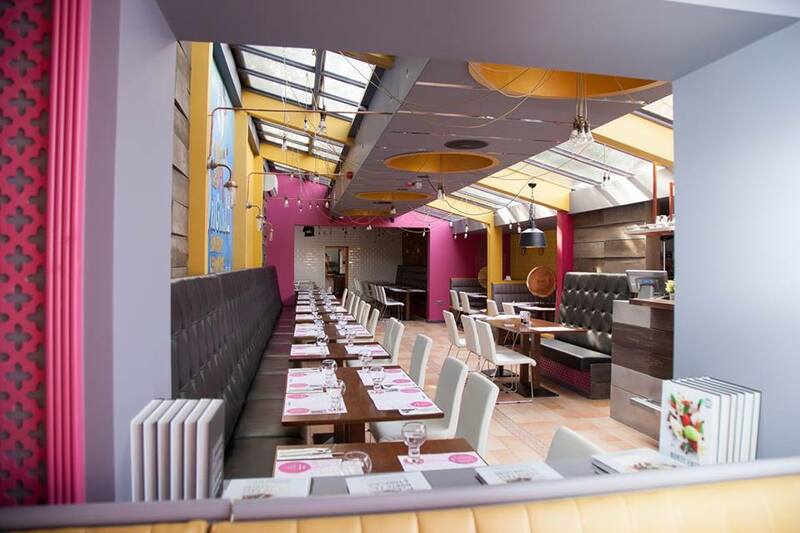 The original Dabbawal situated in Newcastle’s High Bridge street opened in 2011 and quickly established itself as the place to go for quality, authentic, street-inspired Indian cuisine. 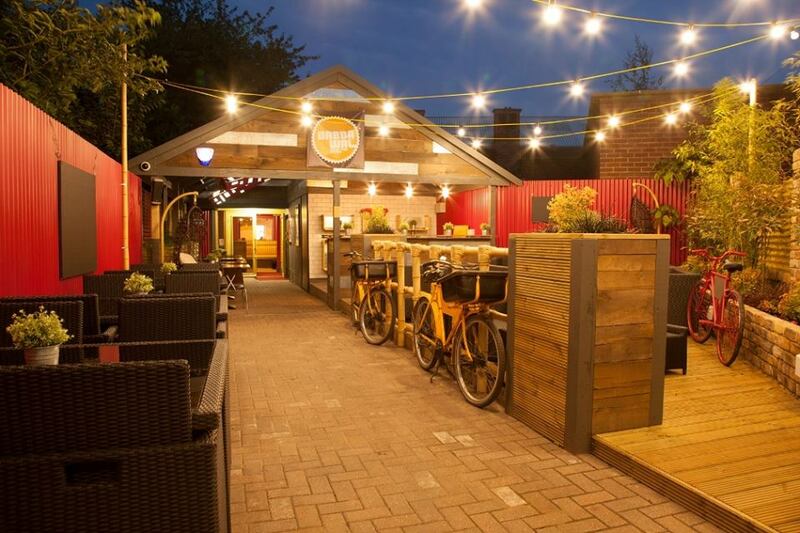 Dabbawal Jesmond is tucked away behind Brentwood Avenue, a short walk from the West Jesmond metro station. Walking down the cobbled street you are first greeted by the outside seating area and veranda, crowned by rows of twinkling lights and flanked by Dabbawal‘s trademark bright coloured bicycles. It all promised a delightful dining experience and we expected that we’d be in for a real treat! Inside was very busy with a bustling, but relaxed atmosphere. The décor, whilst maintaining elements of the trademark Dabbawal style set by the High Bridge branch – of bright vibrant colours and cool modern interior – still manages to add its own touches to give it its own unique character, that we thought tapped in the urban street-food vibe even more so than the High Bridge branch. Their extensive menu comprises of two main sections; ‘Tapas & Starters’ which includes various chaats, street classics and tandoor dishes, which are designed for snacking and sharing and ‘Big Eats’: more substantial dishes of classic meat, vegetable and seafood curries. In addition, there are a range of ‘Sides’ to choose from including various naans, salads and dishes. And of course, poppadoms with a selection of chutneys, which no Indian meal is complete without! As such, the menu allows you to either order a range of dishes to share and feast on tapas-style, or dine in a more formal fashion, and order starters and mains each. So you really are spoilt for choice! 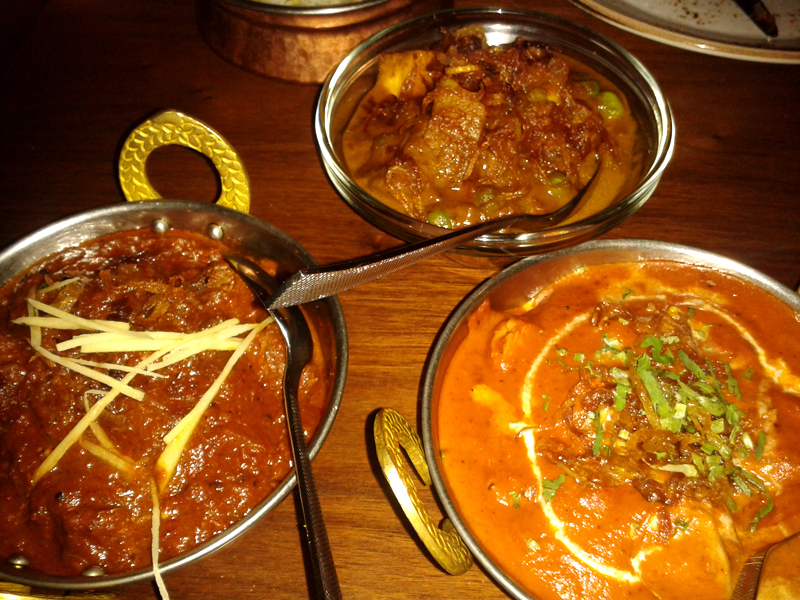 For our starters we were each served a trio of chicken tikka, lamb chop and salmon tikka. Each component was cooked perfectly and delicately spiced to allow the taste of the meat and fish to shine through. Then came the main event, a chicken masala, a lamb rogan josh and a side of yummy vegetable curry, all accompanied by a portion of pulao rice as well as both a plain and butter naan, which were perfect for mopping up the copious amounts of luxuriously creamy sauce of the chicken masala. We sometimes find that dishes served in some Indian restaurants can be a bit too oily and the spicing, heavy-handed and overpowering the flavours of the main ingredients. This however, was not a problem at Dabbawal: each dish was perfectly seasoned and spiced to enhance the flavours of the meat itself, which remained succulent and tender. It is even stated on the menu that they cut the calories in all their dishes by using the leanest cuts of meat and by not cooking with ghee (clarified butter that is commonly used in Indian cooking), to ensure that their food is lighter and healthier whilst still tasty. We’ve been to Dabbawal High Bridge on a few occasions, and thoroughly enjoyed the food and overall experience each time, so we had high expectations for Dabbawal Jesmond. We are delighted to report that we were not disappointed! At £21 the Chef’s Surprise Menu is great value for money considering the quality and sheer quantity you get. The food was every bit as delicious as we remembered from our trips to the High Bridge branch and the service just as helpful, friendly and efficient. We whole-heartedly recommend this new hidden gem of Jesmond! You can also check out Dabbawal’s Facebook and Twitter pages for more news and offers!